I give this work mixed reviews. On the positive side, Kaag's biographical depiction of Nietzsche's young adult years, and especially his relationship to Richard Wagner was one of fullest I have come across. Kaag's depiction of Nietzchean concepts was largely helpful. His rich descriptions of Sils Maria and the Waldhaus were spot on and especially relevant to someone who had just returned from there and hiked many of the trails traversed by Nietzsche (and Kaag). The photo above is the boulder that Nietzsche attributes as his source of inspiration for his idea of the 'eternal recurrence'. But what was deeply disappointing in this work, and to my mind could have been easily corrected, was Kaag's absolute refusal to include references and footnotes throughout this book. As an avid Nietzsche aficionado, Kaag asserted many claims that I have not come across before, and to not be able to go to his references was very frustrating. I hope Kaag will eventually consider editing a new edition that is sourced. For any serious student of Nietzsche, that would prove invaluable. 60 people found this helpful. Curious, introspective, courageous, and intelligent are words I would use to describe the intended audience for this book. And those who have encountered suffering on their journey will benefit the most. As a fellow walker, hiker, mountain climber and would-be philosopher, I was enthralled by the writing style the author uses throughout the book weaving his personal pilgrimage in and out of Nietzsche’s stomping grounds high in the Swiss Alps to discuss the thoughts expressed in pivotal books written by this genius who called himself Zarathustra and Dionysus. The book was a good length—although I must admit—I wanted more. The author stays relentlessly on topic and his writing style is honest and engaging. He writes from personal experience and years of research. It was a bit unusual that he and his wife (also a philosophy teacher) ) took their young daughter on this pilgrimage of outdoor adventure, but Haag skillfully weaves in lessons gained from the child that redeemed the oddity. The book reminds me of a bit of Sarah Bakewell’s masterful “At the Existentialist Cafe” in that it makes difficult philosophical ideals more accessible by utilizing real-world situations. The unique aspect of staying in Nietzsche’s spartan haunts and hiking his mountain trails to better understand and explain this tormented man’s insights was brilliant. It is one of those rare books where one discovers a eureka moment on almost every page. I could not put it down. 50 people found this helpful. 5.0 out of 5 starsBest Introduction to Nietzsche, ever! I have been a "fan" of Nietzsche for more than 60 years, and never read a better introduction to his Thought and Life! John Kaag, a Professor of Philosophy, writes (beautifully) of his personal experiences climbing the same mountains of the Swiss Alps as Nietzsche, while recounting his Life and Philosophy. The ideal first taste of Nietzsche, this Book will also please those who have already enjoyed his unique Writings. Bravo, Prof. Kaag! This is a readable book by an agreeable guide to Nietzsche, who asks how does one become who one is in life. Alongside that brutal question is a kind of epitaph for Nietzsche, who comes across as an intelligent, but solipsistic nihilist, unconvinced of the meaning of it all. The author cites a number of other authors and philosophical traditions, but the book gets caught up with the pilgrimage to Nietzsche's old alpine haunts and the daily events of the author's life as a young married father. The philosophical question(s) are entirely pointed to the interior self, rather than to the grand context of life in the world as we know it. From Nietzsche to Malraux to Camus to Mishima, one has the feeling that their suffering unto collapse might have been mitigated by looking at the truly abject condition of most people's lives and trying to do something constructive to ameliorate it. Exaltation of the self (whether in the excruciating consumerism of today or the heroic conceits of the übermensch) tilts toward totalitarianism. Sometimes that all-consuming conviction is acted out upon the world, whether in the sublimation of the individual to the Japanese state in WWII or in the absolutism of Islamic radicals against the state. And so it goes. This book has a lot of food for thought and is thoroughly pleasant to read. I just wish there had been a more Thomas Merton-like struggle between self and world. I really enjoyed this book. Professor Kaag weaves his own story of his relationship to Nietzsche into his exploration of Nietzsche's life and work. To me, it is Kaag's journey and the unique way Nietzsche has influenced his life that makes for a compelling read. Compelling because we see Kaag wrestle with his own demons and because Nietzsche becomes more accessible through Kaag and his journey. 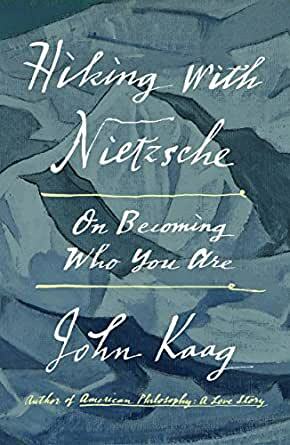 Kaag himself embodies Nietzsche's charge to "become who you are."